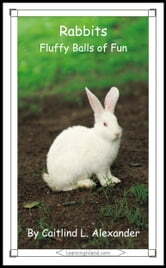 Rabbits are small, furry animals that live all over the world. Most rabbits like to live in groups called herds. Some rabbits like to live alone. They have an egg shaped body covered in very soft fur. Most rabbits have fur that is the color of the area they live in. This helps them to hide from their enemies. If they live among dirt and twigs, they will be brown or spotted. If they live in snow, they will be white. Some rabbits even change color. They will be brown in the summer and white in the winter. Rabbits have back legs that are much longer than their front legs. These back legs are very strong. They use their back legs to help them jump and to run fast. They also use them to kick in a fight. Their back legs are so strong that some rabbits can jump three or four times as high as they are. What are three things rabbits use their back legs for? What rabbit has the biggest ears? What are two things rabbits use their whiskers for? Can rabbits breathe through their mouth? Learn what a rabbit looks like, where it lives, what it eats, who are their enemies, how babies are born, and other fun facts.